Pulled pork in the slow cooker. Served with coleslaw and spicy, tangy barbecue sauce. Barbecue pulled pork with a spicy tangy barbecue sauce. Who’s in? 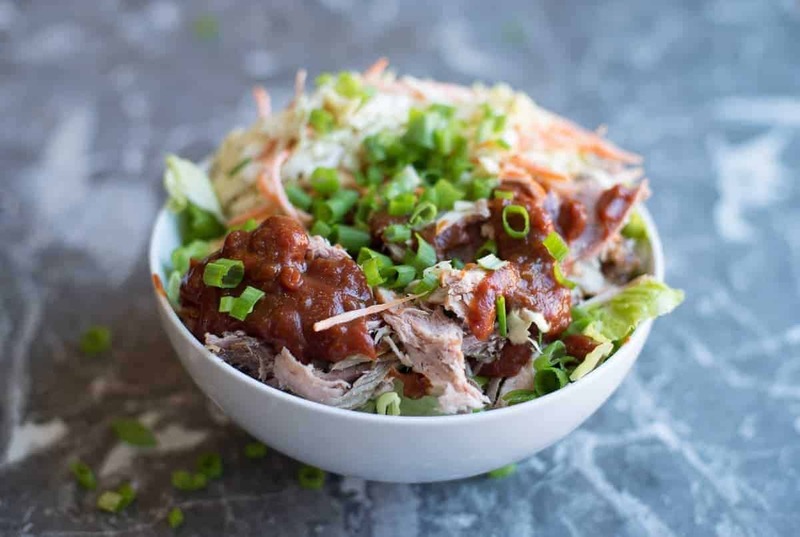 Try this macro friendly bowl of BBQ heaven, complete with a crunchy, creamy southern style coleslaw. It is like your favorite pulled pork sandwich platter without the bun. 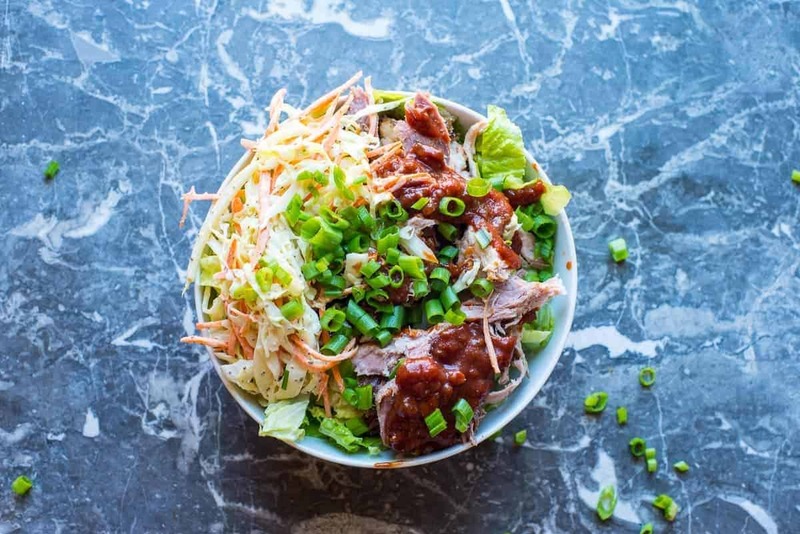 Our latest beast bowl features rich meaty barbecue pulled pork that’s super easy to prepare in the slow cooker. It’s smothered with a delicious, spicy, tangy barbecue sauce – that you should always have on hand. And, it is then topped with a healthy helping of crunchy, creamy, southern style coleslaw. Damn, that’s a delicious bowl of yumminess if I ever saw one! This beast bowl is proof that you can have all the flavors you love and still eat a healthy diet. The problem when you stop in for a BBQ meal at a restaurant is that there are usually a ton of sides. Most aren’t quite as friendly as you want them to be if you are trying to stay lean. This beast bowl lets you eat the BBQ and still feel good about it. It’s all about making smart choices each day. Salty, sweet, crunchy, tangy goodness…all in one bowl. The beast bowl concept allows you to get the flavors that you crave; while also getting the veggies that you need. I promise that you will not feel cheated with this bowl of pulled pork deliciousness. I love barbecue. My brother happens to be an amateur pit master. His pulled pork is insane! He is truly dedicated. He will set his alarm every few hours to get up and feed his smoker so that a pork shoulder will smoke through the night. It comes out perfectly cooked, falling apart – and with that true bark that you only get with real smoked meats. I’m salivating just thinking about it! I have actually never tackled smoking meats myself. It’s definitely on my to-do-very-soon list. Just because I’ve never done it, doesn’t mean that I don’t appreciate a delicious piece of pulled pork. To make this beast bowl approachable I decided to make the pulled pork in a crock pot. It is so easy! You seriously can’t mess it up. Simply rub the pork shoulder with the BBQ spice mix and then put it in the crock pot. No water – nothing. Just set it on ‘cook’ and go. If you are leaving it all day then set it on low. If you will be around, then crank it up to high for a few hours. Cooking times will vary. You’ll know it is done when it’s falling apart. Let’s talk about Barbecue Sauce. Easy to make and you know what’s in it! 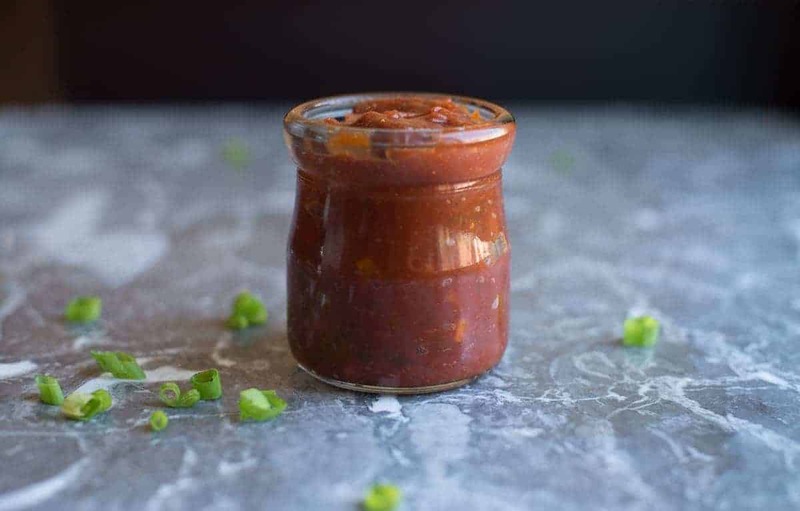 Spicy, tangy barbecue sauce is an absolute must. This recipe is a keeper! It’s adapted from a recipe that my mom had from a family friend. The original recipe is called Weber’s Tangy Barbecue Sauce. I added some jalapeño to make sure it had a little kick. I like a little spice in my life. The sauce is a little bit chunky, if you prefer a smoother sauce hit it with an immersion blender. 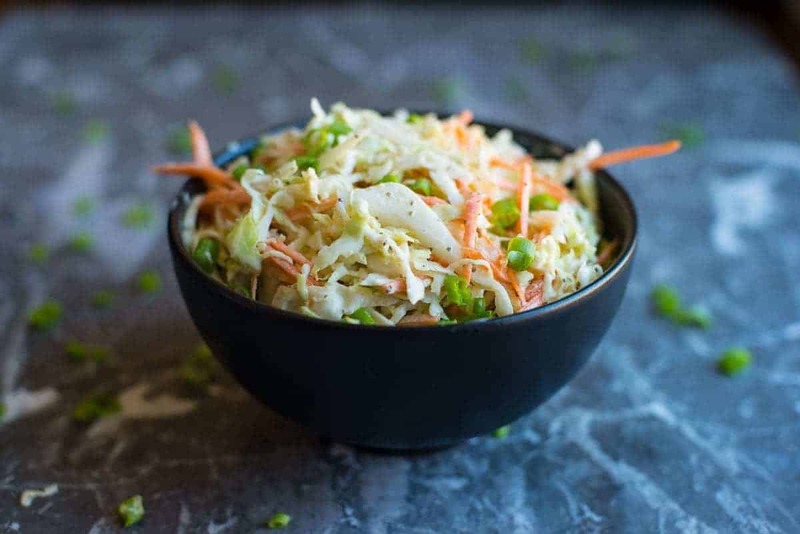 Coleslaw is practically a religion in The South. The perfect balance of sweet and creamy. Not everyone subscribes to the same coleslaw religion. Some like it sweet. Others insist it should be creamy. Then some believers testify that it should be both. Our version checks both boxes. It is a little bit creamy and a little bit sweet. I include my secret ingredient (which I also use in my potato salad recipe), celery seed and celery salt. Tender, juicy pulled pork topped with a spicy, tangy homemade barbecue sauce and a southern style cole slaw. A healthy alternative for you barbecue craving. 4 tbsp BBQ spice mix Get ours for FREE, just sign up! Put in the slow cooker. Leave on High if you will be home. Cook until the meat is tender and falling apart. Leave on Low if you will be out all day. Remove from slow cooker, let rest for about 20 minutes and then shredded with 2 forks. Add butter, onion, carrots, celery and jalapeño to a medium sauce pan. Sauté on medium high until vegetables are tender and fragrant. Add sugar and let it dissolve and get slightly bubbly. For a smoother barbecue sauce, use an immersion blender to blend it after it has cooled. Shred carrots and cabbage and place in a large bowl. In a medium bowl mix up ingredients for the dressing. Toss and let set in the refrigerator for an hour before serving. Chose your fixin's. Add to a large bowl. Top with meat, barbecue sauce, and coleslaw. Substitutions: You can use chicken instead of pork. If you have some BBQ expertise, try some brisket. Vegan Adaptable: Use seitan instead of meat. Use coconut oil in the barbecue sauce instead of butter. Use vegan mayo in the coleslaw. 1. Cube the pork shoulder and sprinkle with BBQ seasoning mix. 2. Turn Instant Pot to the sauté setting. Add a few tablespoons of avocado or coconut oil. 3. Add half of the pork shoulder, allowing enough space to ensure browning. Remove the browned pieces to a plate to rest while you brown the remaining meat. 5. Add all of the meat to the instant pot. 6. Close the lid and set to sealing. 7. Cook on manual high pressure for 40 minutes. Once the cooking time is up, allow the pressure to release naturally for 10 minutes, then do a quick release. 8. Remove the meat from the instant pot and shred.